A unique partnership between Lincolnshire County Council and the Royal Air Force provides the public with a gateway to the home of the RAF Battle of Britain Memorial Flight at RAF Coningsby. An opportunity to see the Flight’s historic aircraft at close quarters and to observe the RAF BBMF technicians working to maintain them in airworthy condition. The Royal Air Force Battle of Britain Memorial Flight began operations in 1957 at Royal Air Force Biggin Hill with Hurricane LF363 and three Spitfires Mk XIX’s. Over fifty years later the RAF Battle of Britain Memorial Flight operates six Spitfires, including Spitfire P7350, the only remaining airworthy Spitfire to have fought in the Battle of Britain; two Hurricanes, a Douglas Dakota and PA 474, the world famous Avro Lancaster ‘City of Lincoln’. 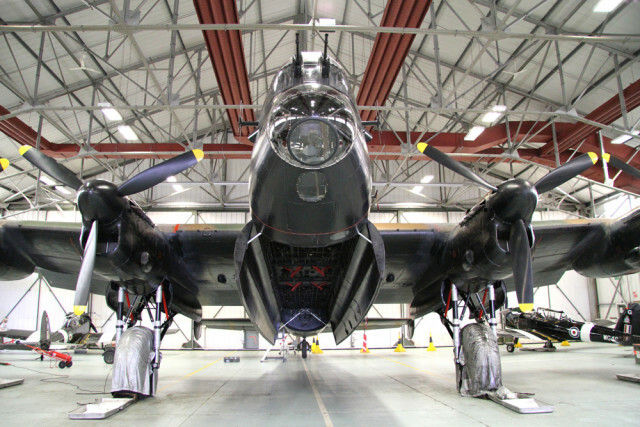 This is one of only two remaining airworthy Lancaster aircraft in the world. Dogdyke Road, Coningsby, Lincolnshire, LN4 4SY.